Google has released an update to the Gmail app for Android and with the update comes some nice inbox management tools. The update is in the process of being released into the Google Play Store and should be arriving on your Android phone or tablet over the course of the next few days. 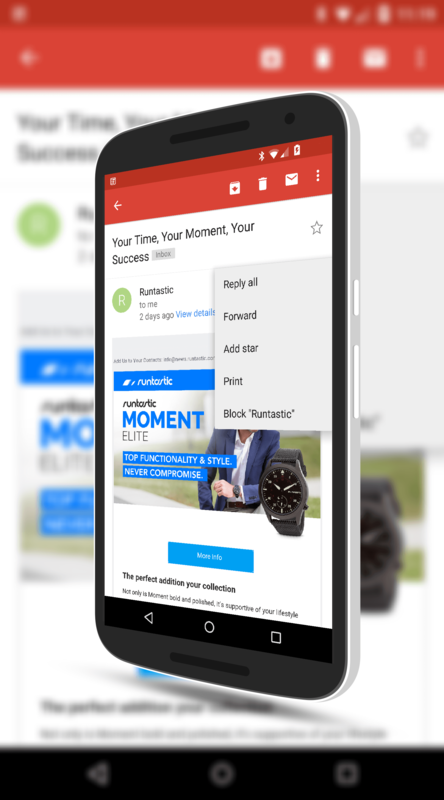 With the update will come the ability to block senders (something you can already do but it is improved) and unsubscribe to a newsletter from the message menu. It gives you a bit more control over your inbox and should help declutter it a bit. In the updated version of Gmail, when you select a message from a sender that you want to block, use the message menu and tap the block option at the bottom of the menu. Again, this has been in the last couple of updates to the app so this may not be big news for your. The other big change is if you open up a newsletter that you have subscribed to and don’t want to get it in your inbox any longer, you will see the option to Unsubscribe. This new feature doesn’t actually unsubscribe you from the newsletter. Rather, it pushes the newsletter to your Spam folder which you can clear out periodically or go and retrieve the newsletter if you decide you want to read it. In both instances, you can remove blocked users and unsubscribed newsletters in your settings inside Gmail so you can reverse your decision at a later time. Look for the update to Gmail to hit your devices in the coming days. As a side note, both of these features are now up and running on the Gmail web portal.